Brown is one of my favorite neutrals to wear. It works well for me and treats me kindly. Last year I purchased a brown blouse. It was comfy and did a fine job of hiding that mumma belly I earned thanks to multiple pregnancies, including a multiples pregnancy. At the time I purchased the blouse it fit slightly tight in the bicep, more than I'm accustomed to. I purchased the top anyway with the notion that I'd lose a centimeter or two off the arms and all would be well. My intentions were good but let's just say that a long winter and these lovely kettle chips from Costco did not help me get there. Well I've come a long way baby and there is no point in looking back at what I didn't do. 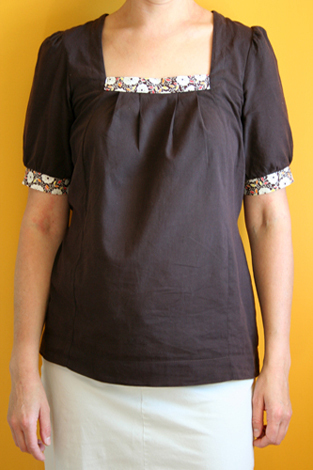 I really like that shirt and I'm not going to let a little muscular bicep *cough* stand in the way of me and my brown top. I did what any desperate thinking woman would do. 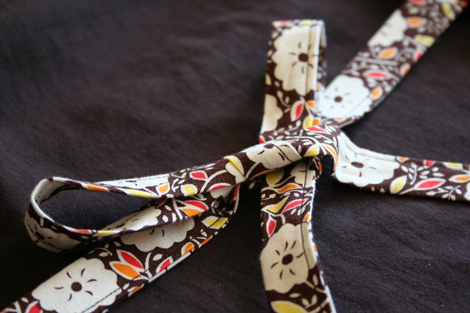 I gathered my stitch ripper and some katie jump rope fabric and went straight at it. The old brown arm cuff was removed, as were the ties that did up in the back, they were way to thin anyway. I attached a slightly wider cuff to the arm sleeve and fresh ties. After I completed the shirt I tried it on and felt like something was missing, a focal point. The neck line seemed a good place to start since the pleats were high needs. I wasn't willing to take the seam apart so I did some magical fixing with the fabric over the existing pleats and top stitched everything in place. I love simplicity. I actually the like the top more now with a bit of fabric contrast then when it was completely brown. 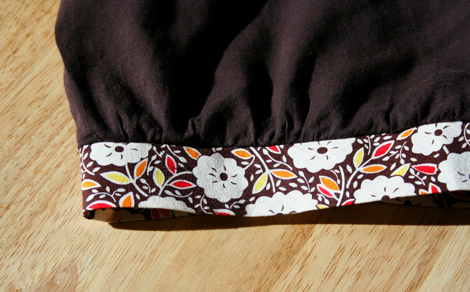 So much so, that I put an order in to one of my favorite etsy sellers for more katie jump rope - geranium fabric so I can make a matching skirt! I think I might be onto something here, closet be warned! I love the accent, it adds a nice punch of color and interest! Very striking! A skirt would be a perfect touch. Perfect for the beach or wherever your summer takes you. Hi Tamara! Today i just found your blog and now i'm a new folower... you have a beautiful family. the pictures and what you do or did is amazing! a big hugh from México! Thanks Erica, it's becoming a fast favorite for me this summer. Yes and now that the fabric has arrived safely in the mail, I can get busy on that skirt. As long as summer hasn't left us yet?! Wonderful to have a new friend from Mexico!! Speaking of my family, my son has been asking us for a few years now if we can go to Mexico during the winter time so he can see the monarch butterflies in all their splendor. It would be oh so lovely a trip... one day. Thank you for leaving a comment and for visiting my little space. Best wishes. Very cute! Love your fabric choices even now! Can you tell me the pattern you used to make this?